Dried lake sediments left behind a shrinking lake. Photo courtesy of NOAA. Compared with fast and fascinating weather disasters such as hurricanes and tornadoes, drought doesn't get much attention. It's a quieter disasterone that creeps in so inconspicuously that it's not always clear that it has arrived. Despite the fact that it is less obvious than other disasters, its pervasiveness and persistence make it every bit as deadly as intense storms. In cases of severe and long-lasting drought in areas without stable infrastructure, widespread famine and political unrest result, and the environment sustains damage that can take years to overcome. Drought is an ever-present threat to all people whose lifestyles have been built on the availability of water. Across the planet, millions of humans make their homes and grow crops in areas that receive minimal amounts of precipitation. Even a slight decrease in the annual amount of rain in such regions can cause crops, animals, and human populations to suffer. 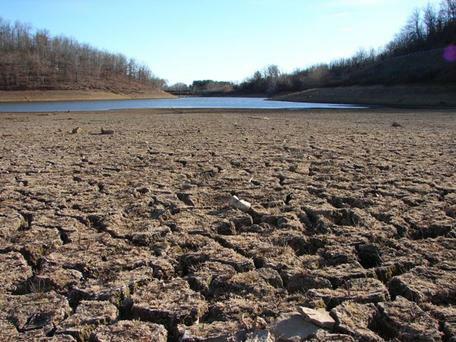 Students learn that when precipitation drops below normal, drought conditions can develop and economic, environmental, and social impacts can follow. The unit teaches students to interpret climate data to recognize the symptoms and evaluate the severity of drought. It helps them realize that drought can still devastate areas that have stable infrastructure and access to expensive technologies. The unit raises awareness of the need to be prepared to face drought conditions that may become more common as our planet warms. What are its causes, symptoms, and impacts? Where and when does drought occur? How can humans reduce the impacts of drought? Can new technologies beat drought? Lab 2: What's a Watershed? Lab 7: Is Your Region Ready for a Drought?